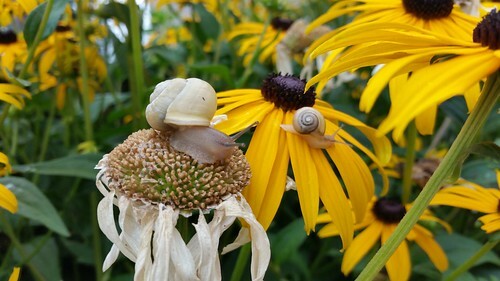 Two snails--one on a dead flower and a smaller one on a live flower. I feel like I hit the jackpot with this photo. Apparently the climate was just right for the snails to come out and try to get some snacks. These weren't the only snails I saw, but this was by the far the coolest picture I could capture. I love the juxtaposition between the two snails. I feel like you could split these into two pictures as an almost "before" and "after" picture (though I know they are two different flowers--the premise works still). I see this photo and all I can think of is the dialog that these two are having as if they are parent and child.